Since 1984, visitors to the Erie Art Museum have been delighted to discover Lisa Lichtenfels’ The Avalon Restaurant. 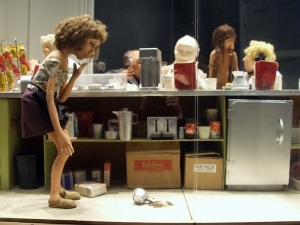 The installation depicts a moment from the life of the Avalon, a now-defunct downtown diner. The Avalon contains 21 soft sculpture figures, scaled to 1/3 life-sized, each remarkably lifelike and painstakingly detailed. Artist Lisa Lichtenfels was born in Erie and attended Harborcreek High School. She graduated with honors from the Philadelphia College of Art in 1980. Her first interests were in animation and illustration, but in college she began to work in three-dimensional figures. Her series of soft sculptures, inspired by Philadelphia street people, won the prestigious Ely Award. After a year’s stint in the animation department at Disney Studios, Lichtenfels left to devote herself full-time to her sculpture. She first showed her work locally in the summer of 1982, when her exhibit entitled Dolls was on display at the Erie Art Center. That year the Museum acquired the Avalon Restaurant for its permanent collection. 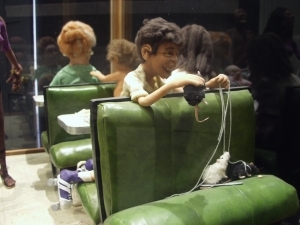 In 1983, Lichtenfels’ Krazy Horse Saloon diorama was displayed as part of the Erie Art Museum’s grand opening exhibition at its new home at 411 State Street. The artist’s method reveals her fine attention to detail. Working from sketches, Lichtenfels constructs a skeleton from armature wire, including a skull with individual teeth and lifelike eyes. Cotton batting is stitched onto the skeleton to form the musculature, and the entire sculpture is covered with nylon of the desired skin color. 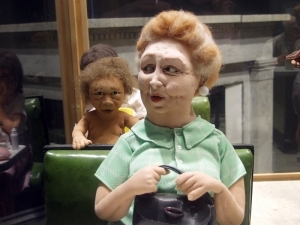 The eyes are made of carefully painted marbles, the fingernails are of plastic, and the hair is unspun wool or wig hair. The result is a unique, anatomically detailed sculpture. Each figure takes more than a month to complete. Lichtenfels worked as a waitress at the Avalon one summer during college. She described herself as “a terrible waitress…but one of the reasons was that there were such interesting people there.” At the Avalon, Lichtenfels was able to “study character,” which would influence her work. Years later, Lichtenfels happened to be back in Erie when the Avalon was closed down. At the same time, the artist was in the process of developing her distinctive soft sculpture technique. Distressed at the loss of the special community that the restaurant was for many people, Lichtenfels set out to “immortalize the Avalon” through sculpture. The Erie Art Museum receives general support from Pennsylvania Council on the Arts and the Erie County Gaming Authority and is a partner of Erie Arts & Culture.